Chemonite® wood has been safely and successfully used since the 1940’s in commercial and industrial applications. It is leach-resistant in water and ground. Chemonite® is the registered trade name for wood protected by ACZA, ammoniacal copper zinc arsenate, against termites and fungal decay. The treatment was originally developed, and remains today, as a waterborne system which can consistently meet recognized standards of penetration and retention in otherwise difficult-to-treat wood such as coastal Douglas fir. Chemonite® wood offers all of the appealing characteristics of wood along with prolonged service life. It is protected against the major causes of wood degradation: fungal decay, termites, and marine organisms, and studies indicate resistance to carpenter ants, woodpeckers, and fire. It has protection both above ground and in ground contact, as well as in fresh and salt water. Protects against fungal decay and insect attack, even Formosan termite. Effectively penetrates coastal Douglas fir. Long history of successful use. Studies indicate resistance to carpenter ants, woodpecker damage, and fire. Provides protection at all levels of exposure — above ground, ground contact, fresh water and salt water. May be stored, handled, and worked like untreated wood. Recognized by model building codes. Leaves surface free of chemical deposits. Sawn timbers or supporting columns used for bridges, barns, homes, or other uses. 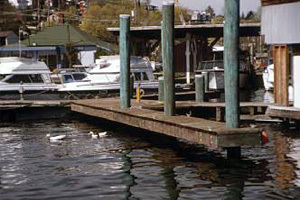 Construction: Bracing with round timber piles rather than sawn timbers is recommended for marine construction below high tide. All untreated wood exposed by cutting or drilling should be adequately field-treated. Avoid removing the outer shell of wood where treatment is heaviest and decay-resistance greatest. It is recommended that all structures be prefabricated before treatment; minimize problems by specifying framing and boring before treatment whenever possible. Worker Safety: Chemonite® wood can be stored, handled and worked like untreated wood. As with any wood, wear gloves to avoid splinters, wear eye protection and a dust mask when sawing, drilling and sanding. Wash hands before eating or smoking. Dispose of cut ends in a proper landfill. Treated wood should not be burned in open fires or in stoves, fireplaces or residential boilers. Treated wood from commercial or industrial use may be burned only in commercial or industrial incinerators or boilers in accordance with state and federal regulations. ACZA is listed in the American Wood Protection Association (AWPA) Standard P22 (formerly P5) for Waterborne Preservatives. Wood treated with this preservative is accepted in AWPA Standard U1 for applications in Use Categories 1 through 5, that is, from interior applications to salt water immersion. Within the requirements of the standards, ACZA can be used to treat numerous species of wood, however its ability to penetrate makes it particularly useful in the treatment of coastal Douglas fir, for which it is most commonly used. AWPA standards are referenced in government specifications and model building codes for treated wood products. Chemonite® wood is also listed in standards of the Canadian Standards Association (CSA O80). The Western Wood Preservers Institute, in conjunction with industry representatives, users, and scientists, developed BMPs to help insure fixation of preservative chemical in treated wood prior to shipment. In the fixation process, some preservative components bond to the wood while others form insoluble precipitates. Specification of BMPs results in wood with a very high percentage of fixed preservative, and may also reduce shipping weight. BMPs have been established for Chemonite® treated wood. Details are available on the WWPI website or by contacting a producer. In many western species, penetration improvement methods are employed to improve the depth and uniformity of preservative penetration into wood. 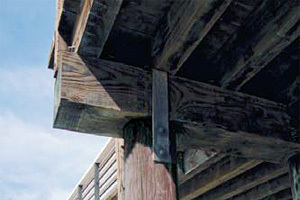 Most commonly this is seen as a pattern of slits ("incisions") on the surface of lumber. Full-length incising and deep-incising are other methods, as are radial-drilling and through-boring, used mostly for poles and piling. Although these methods can improve preservation, they can result in a strength reduction for the wood, depending on the pattern, size, and number of incisions. When treated sawn wood products have been incised, the reference design values must be multiplied by the incising factor, Ci, in accordance with section 4.3.8 of the National Design Specification for Wood Construction. A review of penetration improvement methods is recommended before insertion into a specification. This phrase — Treated to Refusal — indicates that the wood was treated under specific conditions until it refused additional preservative, a point usually below the requirements of industry standards. The result is wood that cannot be relied upon to last as long as wood that meets standards. Such wood does not comply with model building code requirements for treated wood. One reason for substandard material can be use of a preservative other than ACZA which is not suited for refractory (i.e., difficult-to-treat) species. To assure yourself of properly treated wood, look for the logo of an ALSC-accredited inspection agency on lumber tags or ink stamps. The logo often appears beside a Checkmark symbol. Hot-dipped galvanized fasteners & connectors are recommended for use with Chemonite® ACZA-treated wood. Some hardware manufacturers recommend only stainless steel connectors. We recommend no less than post Hot-Dipped Galvanized, HDG, fasteners (meeting ASTM A 153) and connectors (ASTM A 653 Class G185 sheet), where there is contact with ACZA-treated wood. In all cases, be sure to observe building code requirements. In highly corrosive environments — such as exposure to salt air, industrial fumes, fertilizer storage, high humidity, and constant wetting — appropriate stainless steel should be used. For below grade Permanent Wood Foundations, building codes generally require stainless steel. Always use the same type metal for assembly of connectors and fasteners as dissimilar metals can accelerate corrosion. Aluminum or electroplated galvanized metals should never be used. These metals are not accepted by the building codes for use in exterior applications. For its dimensional stability, high strength-to-weight ratio, nail-holding capability, and other properties, Douglas fir is prized as a structural lumber. It is not easily treated by waterborne preservative systems, but the ammonia and heat used in the ACZA treating process enable Chemonite® preservative to provide effective protection of the wood. Douglas fir is not a true fir, but comprises several species in their own genus, Pseudotsuga. There are differences among these species and even within them. For some applications, AWPA standards distinguish between coastal Douglas fir (grown between the Pacific Ocean and the summit of the Cascade Mountains) and interior Douglas fir. ACZA treatment can also effectively protect other species, including red pine, eastern white pine, ponderosa pine, jack pine, spruce, western red cedar, northern white cedar, lodgepole pine, and even certain hardwoods. Chemonite® is the registered trade name for wood protected by ACZA (ammoniacal copper zinc arsenate), a waterborne wood preservative. Pressure treating wood with ACZA protects it against marine borers, insect attack, and decay. First developed at the University of California in the 1920s, the preservative was commercially developed for the treatment of coastal Douglas fir and other hard-to-treat species in the 1940s by J.H. Baxter, a California wood preserving company. How is wood treated with ACZA? First, tiny cuts called incisions are made in the wood. Dry wood is loaded on carts and pushed into a large steel cylinder. The cylinder is closed, vacuum is used to remove excess air and moisture from the wood cells, and warm ACZA solution is pumped in. Pressure and heat are applied to force the solution deep into the wood cells. Will the chemicals wash out in water or in the ground? Does ACZA treatment change the color of the wood? Chemonite® treated wood has a dark greenish brown color from the copper compounds in the preservative. But the color is difficult to control. Sapwood will tend to be greenish brown with heartwood tending toward more brownish black. Over time, as the wood weathers, the color becomes more uniform. Does Chemonite® wood have an odor? How do I treat "end-cuts"? Minimize any cutting to obtain the maximum benefit of the treatment by not exposing untreated wood to decay hazards. If you do cut Chemonite treated wood, the exposed areas should be protected by applying copper naphthenate solution or other solution containing at least 1% copper — available at most home centers. Use a generous amount to completely saturate any untreated areas of your project exposed by cutting or drilling. Does Chemonite® wood present a safety hazard? Wood treated with ACZA falls under the U.S. Environmental Protection Agency’s (EPA) minimum protective precautions. Other than the normal safety measures suggested for handling any wood (wear gloves when handling, goggles and a dust mask when drilling or sawing), no special handling or clothing is required. See the Consumer Safety Information Sheet on the website. Does ACZA treatment affect the strength of the wood? The National Design Specification allows the same strength values for treated as for untreated lumber of the same species, grade, and moisture content. However, when incised, the incising factor should be applied. Do nails hold well in Chemonite® wood? Laboratory tests and field experience indicate that nails hold just as well in Chemonite®-treated lumber as they do in untreated lumber. For fasteners and connectors, always use hot-dipped galvanized, stainless steel or an approved equal. Can Chemonite® wood be painted? If so, how soon after treatment? Yes. Simply follow the manufacturer’s instructions. The wood should be clean and dried to 20% moisture content or less before paint is applied. Does the treatment affect the flamespread rating of wood? • Douglas fir lumber treated with 0.35 pcf of ACZA had a 41.7 flame spread rating, which is a Class B rating. • Douglas fir lumber treated with 1.86 pcf of ACZA had a 24.8 flame spread rating, which is a Class A rating. How long will this treated wood last? Thirty to fifty years or longer in many end uses when treated to AWPA standards and barring any incidental damage. 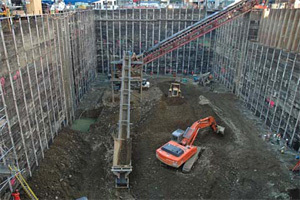 Will Chemonite® wood last if it’s buried in the ground? Yes. Wood treated to a minimum 0.40 pcf retention will withstand wood-destroying organisms in ground contact. Is Chemonite® wood suitable for aquatic applications? Yes. Treatment in accordance with AWPA Standards provides a long service life. Specifying that the wood conforms with the Best Management Practices (BMPs) of the Western Wood Preservers Institute ensures that Chemonite® wood is suitable for use in aquatic environments.